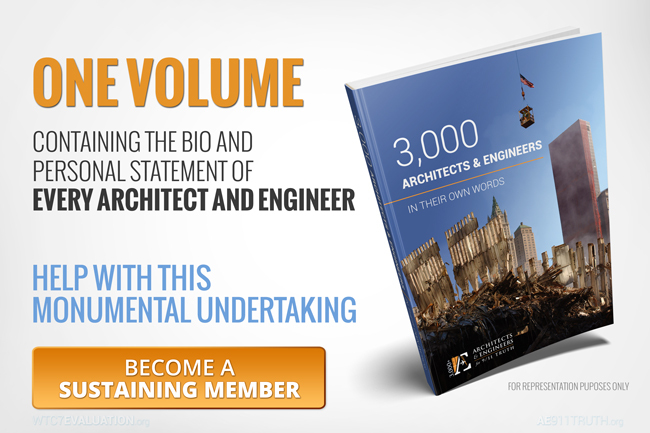 This past Friday, AE911Truth reached and surpassed the remarkable milestone of 3,000 architects and engineers who have signed our petition! There are many ways to view the meaning of this achievement. For example, we often wonder: Could you find 3,000 architects and engineers who are willing to publicly endorse the official theory? We think not — and we challenge anyone who believes otherwise to try it. But the real significance of 3,000 A/Es becomes clear when you begin to read the bio and personal statement of every single petition signer. We recently did this when a Texas congressman asked us to compile a list of every signatory in his state. The cumulative effect of reading their 172 bios and personal statements was staggering. And so we decided to embark on the major task of compiling our 3,000 petition signers and their statements into one beautifully designed volume, organized by state and country. Our goal is to release the document no later than this year’s 9/11 anniversary, but we’ll publish it sooner if we can. This vast repository will have many uses. It can serve as the perfect material to send your members of Congress (pointing out the signatories in your state). It can be used to encourage other architects and engineers to also sign the petition. Or perhaps you’ll find it a helpful resource to identify and seek out these courageous technical professionals. In order to accomplish this time-consuming task, along with our many other projects, we need enough resources to retain our hardworking, dedicated staff. That means we must bring on board 400 new sustaining members during this final week of our membership drive, which ends this coming Friday. We need you now. If you’ve been meaning to become a sustaining member, now’s the time to do it. As with our past two membership drives, a very generous anonymous donor who believes in leveraging his wealth to encourage others to donate has offered to match the annual value of every new membership. Get this: Whatever the sum of your 12 monthly donations, he’ll match it at the end of this drive — effectively doubling your contribution! All we ask from you is the equivalent of one large cappuccino ($5), one deli sandwich ($10), or one movie ticket ($15) per month, so we can continue the vitally important work of disseminating the truth about the WTC destruction. We are grateful to you for standing with us. 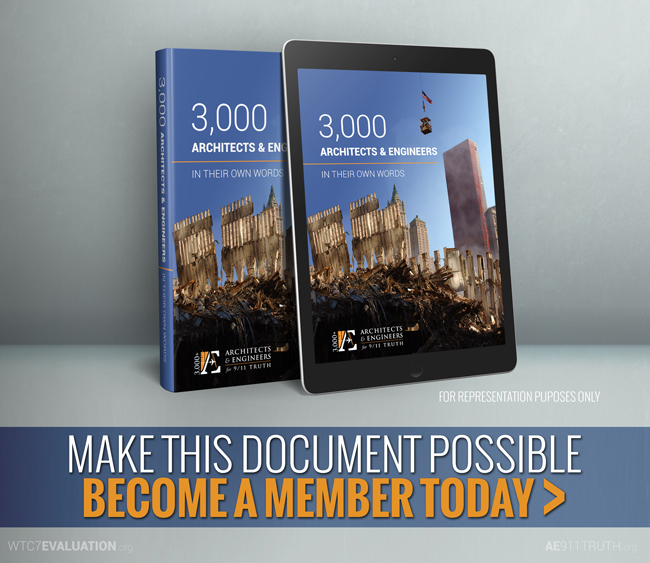 You’re the reason we now have 3,000 architects and engineers demanding a new WTC investigation — and that more are joining every day!